I arrived in London on March 19th 1945 still possessing my Russian uniform was provided lodging at the RAF Dispersal Centre at 6 Hall Road in London and then went straight to MI 5 and MI 9 for a long session of interrogations. I also was interrogated by the Foreign Office. One of their questions was the role played by Bór-Komorowski (General Count Tadeusz Komorowski) in the Warsaw Uprising. There was some contention at the time that Bór-Komorowski initiated this uprising as a result of personal ambition. I made it clear that the Poles I knew in the AK were quite well aware that General Bór was acting upon instructions from the Polish Government-In-Exile in London and also when the Uprising did in fact take place the Russian army stood some 10 miles away and gave no assistance Ref: 3.23. I believe John Ward Ref: 3.24 the english voice on Radio Blyskawica during the maelstrom of the Warsaw Uprising said something similar. F/Lieut. Philip J. Anderson R.C.A.F. Cpl. D.J.F.B. Durston R. Sussex Regt. The ANSWERS given by Hubert Brooks are provided below. Ia) Brooks: Nearly 90% of the Polish People want a Polish Government coming from London. For them it does not matter whether Arciszewski’s Government or MIkolajczyk’s Government return back to Poland. Everyone wants to see freedom without any Lublin or N.K.V.D. help. All Polish Home Parties regard the present Polish Government in England as the right one, and don’t want anything to do with the new Lublin Government. P.P.R. is the only one that I know of that have admitted the new Lublin Regime. P.P.R. was created by the Russians many years ago. In Poland today it is a very weak party. Many members of the Lublin Government are unknown to the Poles. Several of them have been in Russia since the Russian Revolution, and have now returned to Poland to help create the new Lublin Government. 1 c) Brooks: As regards their attitude towards Great Britain and the United States, the Poles would rather be slaves in Britain or the U.S.A. instead of being under a Lublin Government which is controlled by the Russians. If a Pole knows that you are British or American he will give you anything, even his last “shirt”. The Russians get nothing. 1 d) Brooks: The Poles were entirely displeased about the Crimea Conference. Poland has lost to Russia half of her agricultural country. Many Poles would be pleased if Arciszewski would create this new Provisional Government. He is very highly thought of amongst members of the A.K. ( Polish Home Army). II a) Brooks: Many Members of the A.K. have been arrested by the N.K.V.D. Here is one example which occurred in Nowy Sacz to Lieut. Tatar whom I knew very well. Tatar was held by the Russians for nearly two and a half weeks. The Russians knew that he was a member of the A.K. They were trying to find out the whereabouts of his C.O. and officers of the 1st P.S.P. He was offered a very high rank with the new Polish Army if he were to help the Russians. Tatar refused to give them any help whatsoever. Later on he was “rough handled” and suddenly disappeared from Nowy Sacz. Nobody knows where or what has happened to him. From Lwow 25,000 were sent to concentration camps. In the nearby villages of Wilno every cellar is a prison for the members of the A.K. Men who refuse to join the new Polish Army may be shot or sent to Siberia. Many persons have already been shot because they don’t want to give up their own wrist watch. II b) Brooks: Many members of the resistance movement are now employed in offices as clerks. Many officers and men are in the Army who have been sent by the resistance movement to be ready to take in due time that part of “Trojan Horse”. III a) Brooks: Everyone in Poland thinks that the Lublin Government is a temporary one, and in due course a new Government will arrive, after which will be created a more definite administration. The members of the Lublin Administration are mostly Poles, who have spent a great deal of their time in Russia, and now are sent back to create a new government helped by the P.P.R. IIIb) Brooks: The land problem in Poland are very serious for this coming year. The advancing Russian army took every horse and killed all the cattle for military use. The Russians have allowed only 500 Zls of old money to be changed for the new Lublin money. With 500 Zls you can buy 2.5 pounds of butter. Many stores in Poland do not like to take the Lublin money for it has no gold backing. Industry today is at a standstill. The Germans removed most of the machinery. It will take the Russians quite some time to reorganize the Polish industry. III c) Brooks: Every man, women and child in Poland today knows that General Bor was not responsible for the fall of Warsaw. They all blame the Russians for not continuing their march on to Warsaw. They also know that our Air Force were prepared fly supplies to Poland, and the Russians never gave permission for our planes to land in Poland. They also know that General Bor was acting on instructions from London. 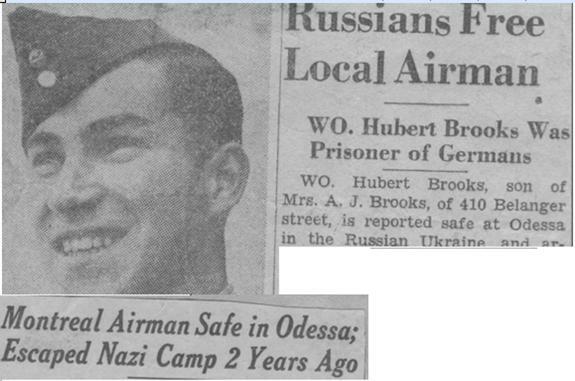 IV a) Brooks: Last summer the Poles expected the Russian Army to liberate them. They were very friendly. After the fall of Warsaw and the arrest of many people by the N.K.V.D. their attitude changed. When the Russians made their second offensive in January, they arrested many Poles, and confiscated all of the cattle. They really do want to see a change in government. IV c) Brooks: The front line soldier confiscated everything (watches, clothing, food). V Brooks: Many Poles have escaped from East of the Curzon Line, and many were arrested by the N.K.V.D. Official immigration by the Russians is now prepared; however, no one, so far, has been moved west of the Curzon Line. Many arrested persons are sent eastward. VI a) Brooks: The food situation is very bad. It was better when the Germans occupied Poland. The Germans took nearly half of quota of cows-corn etc., now the Russians have created a new quota which will twice as high. VI b) Brooks: West of the Curzon Line, railways are entirely destroyed. There is no telegraph service. Roads are better, the Russians are building many provisionary bridges. VI c) Brooks: Sickness is now spreading rapidly throughout Poland. Medical supplies must be sent in at once. VI d) Brooks: I hardly saw any anti-Semitism, because the Germans liquidated most of the Jews. A very small percentage have returned to their homes. They lived in the woods receiving supplies from the Poles. The Foreign Office Summary Report from the series of interviews conducted was extremely damning of Soviet attrocities in then occupied Poland . As it turned out, along with P.O. 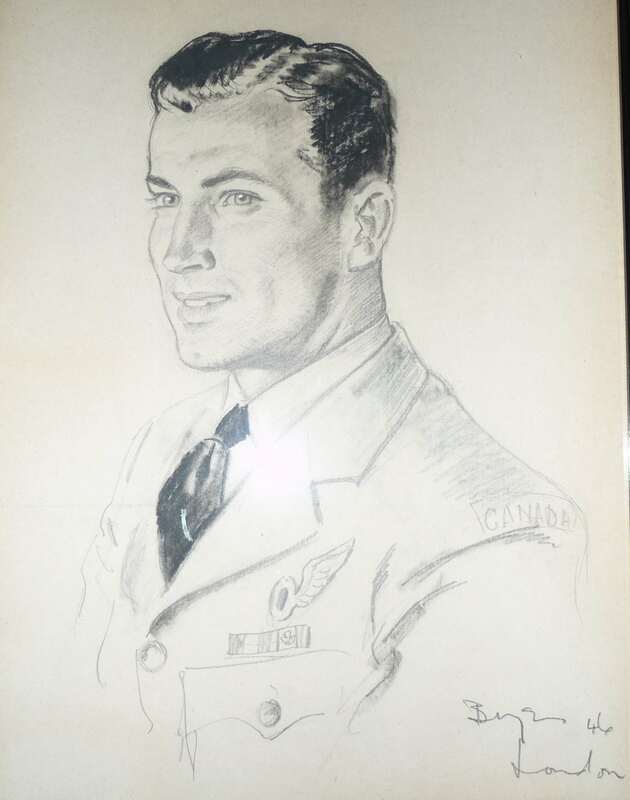 J.A.H Marini, and F/O Philip James Anderson (C.11369), I was one of the first RCAF officers liberated by the Russians. I also found that I had been promoted to Warrant Officer effective 7th July 1942 – a time when I was in a German PoW camp. Letters to my parents has ceased in the spring of 1943, so they had not heard from me for approximately 2 years. During that period, my family was in doubt as to whether I was alive or dead. "……I have been asked by friends in Germany to pass on to you the only information we have of your brother Hubert Brooks….….. 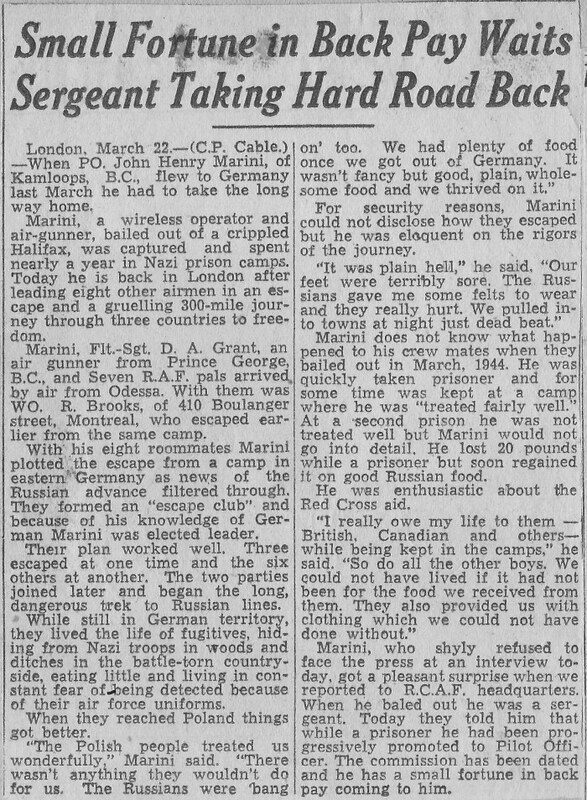 He escaped from the work party on May 10th 1943 and since this date neither British nor German camp authorities have been able to trace him. …… W/O James Paton, to whom you wrote, and others in Germany hold every hope for his safe return." 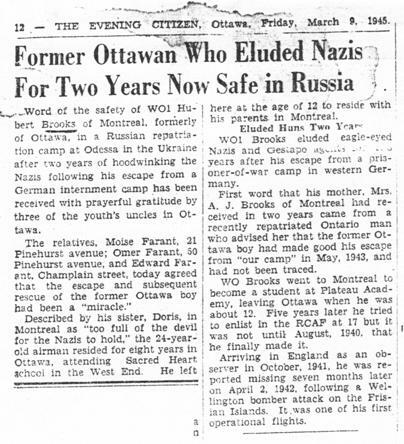 Even the Ottawa Citizen ran a small article about my sudden re-appearance bringing in the local angle that I had lived in Ottawa until age 12 and that my mother's family – the Farants– were still located there. 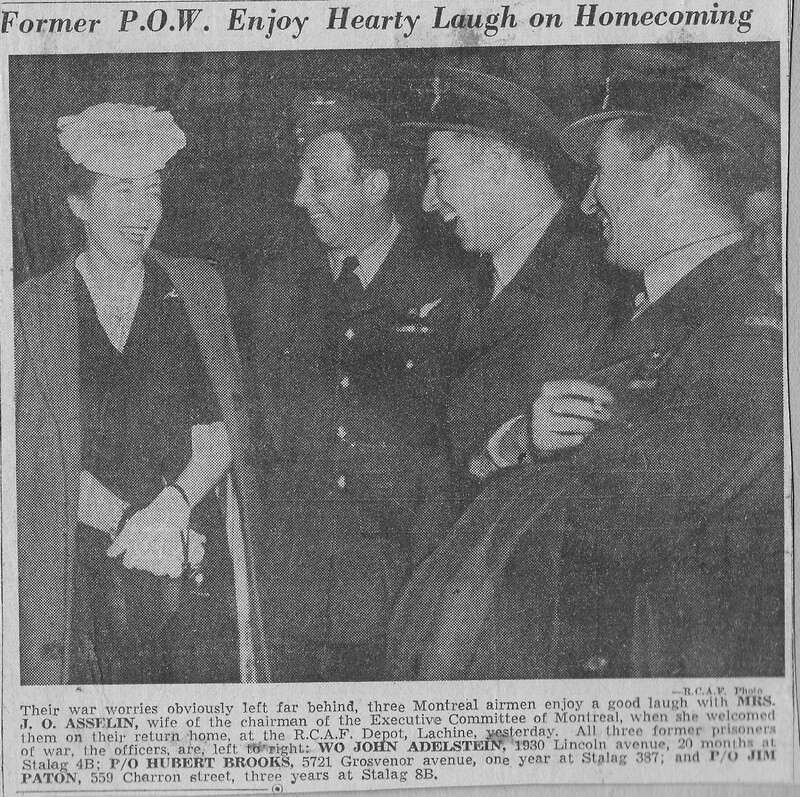 As sometimes is the case, when there is good news – the excitement and pride of having not only made it through the war but also having made a solid contribution to the war effort– not to mention the soon to occur reunion with family and friends – there unfortunately was bad news as well offseting the sense of elation. 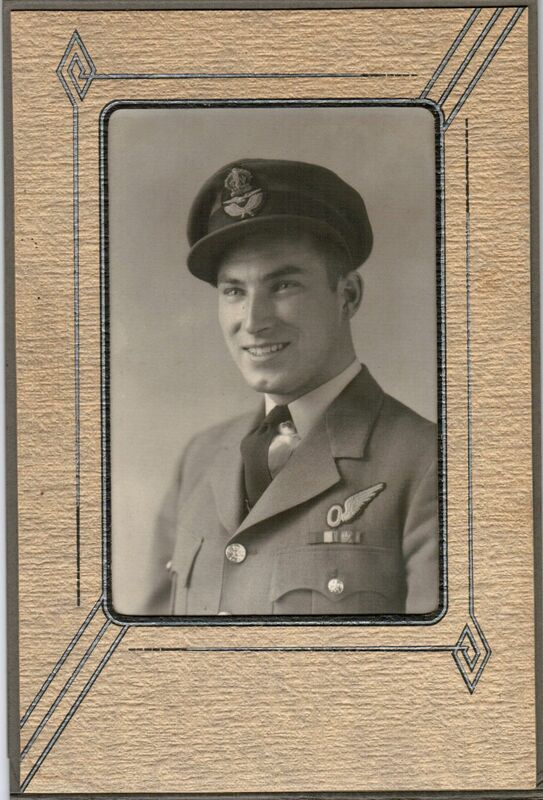 While I was in the UK, I was informed by a RCAF chaplain that my father died in May 1944. 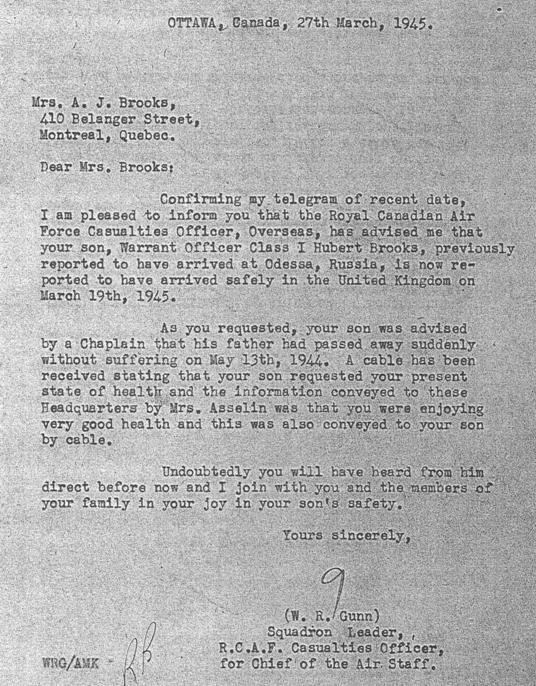 Upon returning to Canada I was informed by my mother that they had received news which suggested that I may have been shot while attempting to escape! 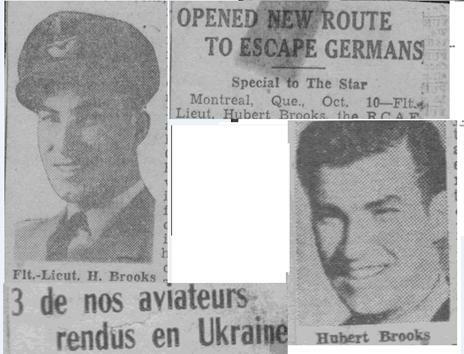 In the latter part of April or early May 1944, my father received a telephone call from the Montreal Red Cross Branch, requesting my father to visit their offices for a confidential talk. My father, apparently, never discussed the subject of this conversation with anyone, and died of a heart attack a short time later. It is believed that the heart attack was brought on by his being told that his son was presumed to have been killed. 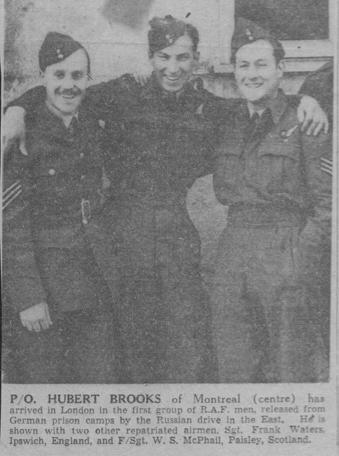 I was repatriated to Canada in late May 1945 arriving at RCAF Station St. Hubert 18– June–1945.